CAIRO (AP) — Dennis Banda scored a second-half equalizer Sunday to help Zambia hold African champion Egypt to a 1-1 draw in a World Cup qualifying match. Amr Zaki had put Egypt in the lead in the 28th minute, but Banda scored in the 56th to give the Zambians one point in Group C of African qualifying. 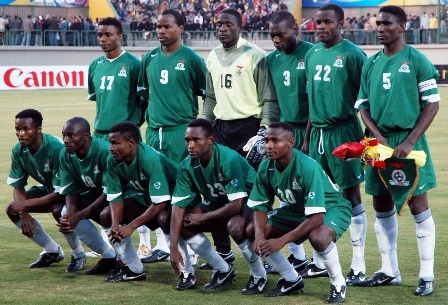 Egypt last qualified for the World Cup in 1990, but the team is favored to reach the 2010 tournament in South Africa after winning the last two African Cup of Nations titles. All four teams in Group C, which also includes Algeria and Rwanda, have one point after one match, with only the group winners qualifying for the World Cup. well done boys, welove you and keep it up. against continental champions Egypt in Cairo. The Copper Bullets from the south of Africa managed to tie the Pharaohs 1-1 in a match where they had their fair share of chances. “I watched the match with my family and I can assure you that from what I’ve seen in the encounter both Zambia and Egypt are solid. I was very surprised by Zambia’s level. They are really tough. We will have to be very strong if we want to beat them,” said the playmaker. Ziani, who is still recovering from adductor surgery and expected to be out for approximately one more month, was missed in his team’s goalless draw in the Desert Foxes first group match against Rwanda in Kigali on Saturday but has already promised that he would do all that he can to be ready to take on Egypt in Blida on June 7th when the two teams face off in a what promises to be a high octane match up. “Right now we have lots of solutions. It is imperative that we win against Egypt in Blida on the 7th of June. After that we will try to get a good result against Zambia. We all saw on our own that Zambia will not be so simple as some people wanted us to believe. I repeat, they will be tough competition,” he concluded.